Recently Copernica added new Database and sender domain management functionalities to their MarketingSuite. DatabaseApp provides Database Management let users manage and structure their data that also provides insight into the data and segments with which they create their campaigns. Sender Domains is a tool to configure Copernica software and DNS records. The wizard also checks if entries are correct, rotates DKIM keys and allows for DMARC reporting. The Copernica DatabaseApp is the successor of the Profiles section of their Publisher software. When opening the new databaseApp, a list with available databases and their selections is shown. Users of the Copernica MarketingSuite can have unlimited databases and configure them as they see fit. When opening a database inside the DatabaseApp, information about the database and options for the database are shown. Users can look up the information about the mailings sent to databases and selections, find information about profiles and see database and selection key figures. The Copernica MarketingSuite allows users to add extra layers to their data through what they call Collections. In Copernica a collection acts as an additional database directly linked to each profile in a database. This can be used when campaigns demand more advanced data structures and are often used to store orders and purchase information on a customer level. Data inside these collections are then available for campaign personalization. 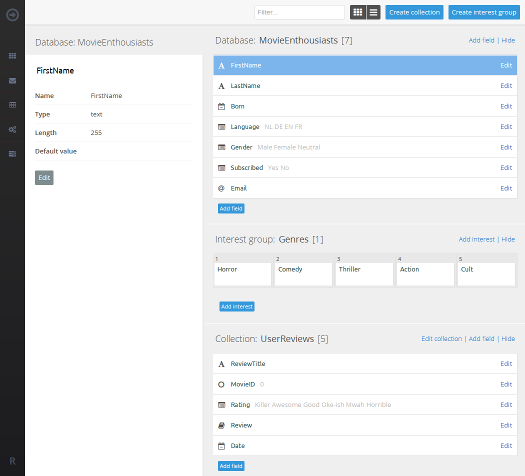 In the screenshot above you can see the Collection “User Reviews” linked to the database of movie enthusiasts. Sender Domains is a tool to configure Copernica software and DNS records through a wizard. The wizard also checks if entries are correct and gives a warning if they are not. 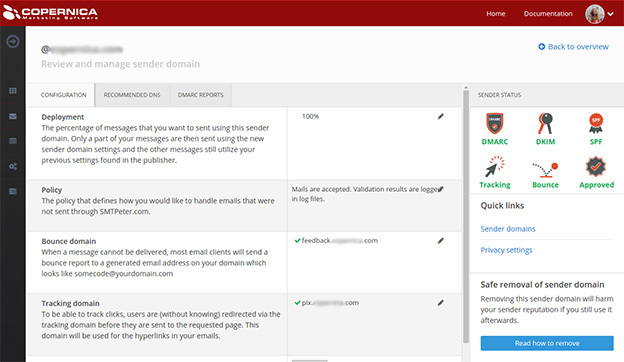 It automatically aligns your domain for email marketing, does DKIM rotation and allows you to see DMARC reports. Below the overview of your Sender Domains and the check on proper configuration. To set it up a user provides the domain they want e-mail messages to be sent from. The Sender Domain wizard will tell what to put in your DNS record. This decreases the chance of failure through incorrect settings. Before Sender Domains users had to host their own public DKIM keys, SPF records, and DMARC records and set up their own click and envelope domains, as well as making sure all used domains are in alignment. Some of these settings should be regularly updated, such as rotating your DKIM keys. With Sender Domains everything can be found in one place. After configuring the domain once. Copernica checks whether you’ve done everything right and keeps your settings up-to-date. By using Sender Domains all domain names in mailings are automatically in alignment. Everything sent, including from-addresses (visible to the recipient), envelope addresses (where bounces and other automatic replies get sent to) and hyperlinks, is inherently recognizable as being yours, because they all carry the same domain name. For example, a domain to track clicks on images will be redirected through a link that’s in alignment with the from-address. Many inbox providers prefer mailings with aligned domains. Private keys for DKIM signatures need to be replaced from time to time for security reasons. Rotating your keys is something that must be done with caution, because due to caching, it can take a long time before all DNS servers in the world are updated with your new keys. Old keys need to stick around for a little while so delayed deliveries can still be verified using the old keys they were sent with. Some e-mail providers (like Gmail, Microsoft and Yahoo!) send out a DMARC report. These DMARC reports can show whether your configuration is in order. They also reveal when and where your domain is being abused. If mail is being sent from an IP address that isn’t yours, it requires action. When you use Copernica Sender Domains, these reports are received and processed by Copernica, and can be viewed from the Dashboard. Copernica lets us know that Database management section is being developed further in the coming months. A new selections builder tool will be added. Creating selections in the current Publisher environment can be a tedious and complicated task because of the many configuration options and outdated interface. Selections are active filters on the data in a database, and can be used to create segments, to filter out email destinations that bounced, to select profiles that were created in a specific period of time, or any other data selection and combinations. After that is prototyping and start of building a new campaign management tool for automated campaigns, as well as a personalization helper tool, which will aim to simplify creating email personalization.